The FlexiPunch-E is the only machine in its class that gives you the option to punch Wire-O, Spiral Binding Plastic Coil and Plastic Comb with a simple switch of a punching die. Now, with the FlexiPunch-E, you can punch your mid-volume binding jobs without breaking the bank on a heavy duty machine meant for high volume punching. The FlexiPunch-E is a versatile modular punching machine at an affordable price that gives you the binding options you need in everyday work. The FlexiPunch-E is an innovative modular punching machine with electric operation at an affordable price that gives you the versatility of different binding options. The FlexiPunch-E has a punching capacity of 20 sheets at a time for all punching dies. Foot pedal punching operation leaves both hands free to prepare the next book. The interchangeable die sets were created with a quick die change design that allows you to easily change from one punch pattern to another within seconds with no additional tools. The FlexiPunch was build to last with its rugged design including all metal parts, heavy cast side plates, and non-skid feet. The Akiles FlexiPunch-E has 4 different punch dies to choose from, including plastic comb, 2:1 Wire-O, 3:1 Wire-O, and 4:1 Spiral Binding Plastic Coil. The adjustable depth margin is available for all punch dies and provides the correct punch margin depth for each element or book size. One die of your choice is free with the purchase of the Akiles FlexiPunch-E. The FlexiPunch-E is an electric punching machine with a Built-in Anti-Jam (Reverse) Feature which is used when a sheet overload is detected and the machine automatically retracts and stops punch operation to avoid downtime. The FlexiPunch weighs about 51 pounds. The machine measures 16.5″ L x 4.75″ W x 6.75″ H, making it small enough to fit on most any desk or table. The FlexiPunch gives users the option to bind three different ways with one compact unit. If you have any questions or are interested in purchasing the Flexipunch-E Interchangable Die Elec. Punch , visit us at SpiralBinding.com. 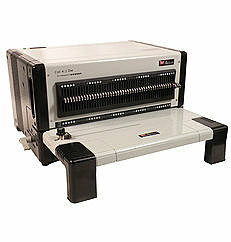 We also have great pricing on a full line of Punching Machines. Call us at 1-800-631-3572 for more information.